The Horn Ranch is one of the most visible and stunning landscapes along the I-70 and Eagle River corridor here in Eagle County. There are two adjacent properties. Horn I is south of I-70 and Horn II is north of I-70. 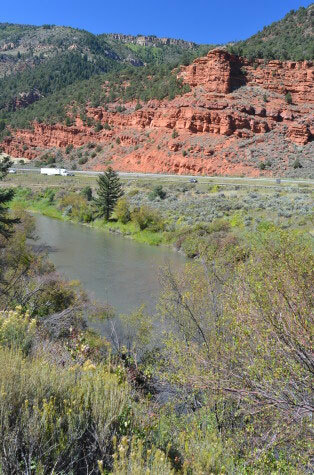 This iconic piece of land is in the heart of the Red Canyon valley, the beautiful landscape of crimson cliffs, hillsides and meadows as you travel between Wolcott and Eagle. It also features stunning access to over one mile of the Eagle River, and serves as a wonderful natural visual buffer between populous and developed areas to the east and west. The Red Canyon valley is one of those “Classic Colorado” landscapes, and the Horn Ranch is a very special open space within our community. This conservation project will forever protect the iconic vistas and stunning views of the gorgeous Red Canyon valley enjoyed by tens of thousands of travelers along I-70 every day. The meadows, cliffs, hills and valleys, and the awe-inspiring land along the river can all be saved forever in their natural state. In addition to saving the landscapes of Red Canyon, the conservation project will protect wildlife habitat in and around the Eagle River, while providing 288 acres of permanent, public open space. 5,900 feet of the Eagle River will also be opened to the public for fishing and floating. The conservation of the Horn Ranch has also preserved some important Eagle County history. A local prospector from Fairplay, Rupert Sherwood, laid claim to the land in 1883 and started a cattle operation. From 1895 to 1915, the Denver & Rio Grande Railroad had a key stop on the rail line on this land. Its bridge was the major crossing point on the Eagle River between Wolcott and Eagle, and it boasted a lumber mill and a saloon. Famous stallion, Sooner Leo, was a resident of the Horn Ranch as well; one of a well-known pedigree of American quarter horses. The area was also an important stone quarry; its’ brownstone was used in the construction of the historic Hotel Jerome in Aspen, the Brown Palace Hotel in Denver and the 1890 Opera House in Pueblo. Protecting iconic local landscapes and historic areas as we drive along Interstate 70 adds to our high quality of life and to our tourism-based economy. The amazing alpine views that we all know and love are part of what keeps us locals here and our visitors coming back. We should all cheer for the permanent conservation of the Horn Ranch and the Red Canyon, one of the most visually stunning places along the Eagle River and I-70 corridor. The Eagle Valley Land Trust is proud to have conserved this valuable open space property for our community forever. We are proud to be a partner in this extraordinary land conservation project. 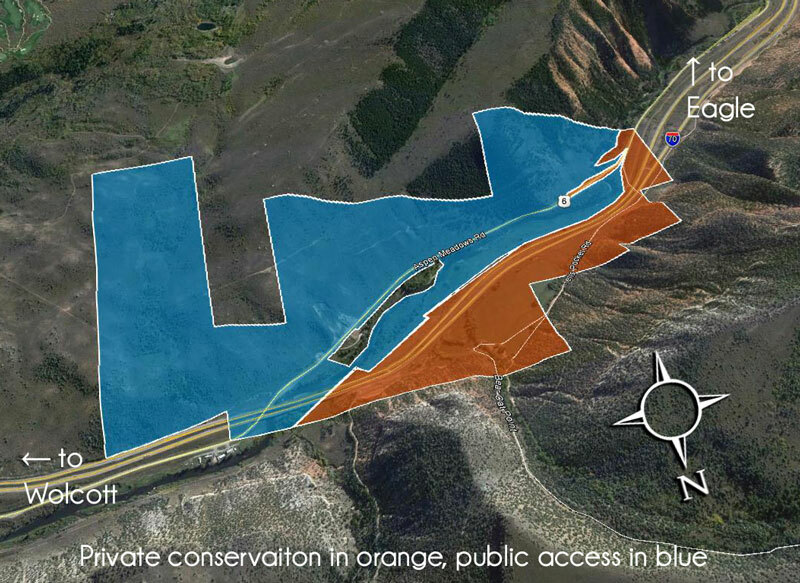 Two of our partners, the Eagle County Open Space Department and Great Outdoors Colorado, are providing significant funding for the acquisition of this land. Public access is limited to the Parking Area, fishing access to the Eagle River on the South side of i-70 and the Eagle Valley Trail through the property. There is no Public Access North of the I-70 bridge or South of Highway 6. Please respect private property.